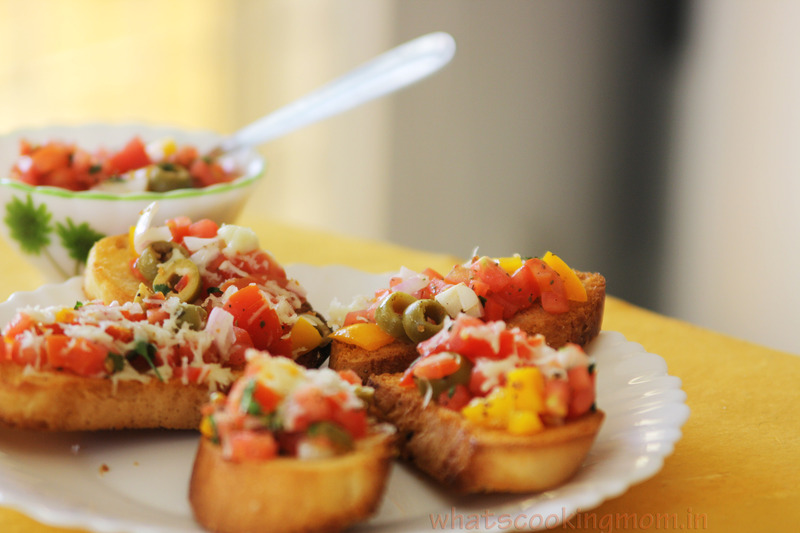 Tomato Basil Bruschetta (Italian pronunciation-brusketta)- it is usually served as a snack or an appetizer. 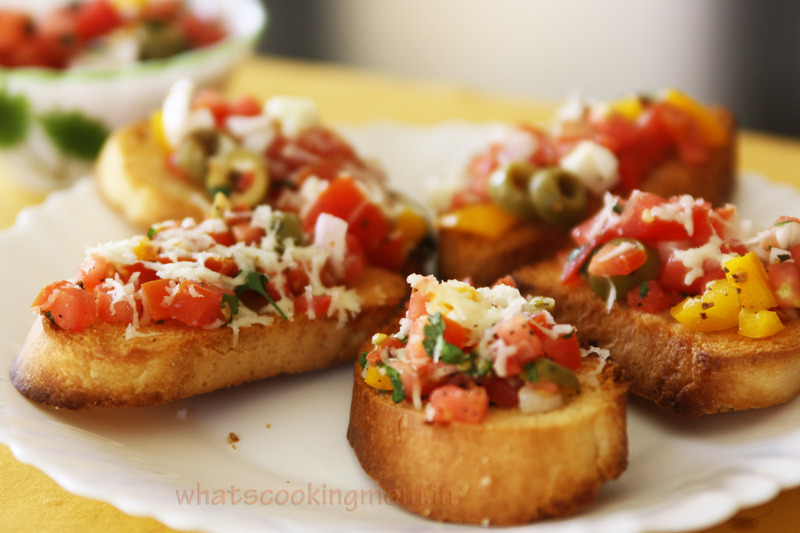 It consists of roasted French bread or baguette topped with extra virgin olive oil, tomato, basil, garlic, salt, and pepper. I have made some changes according to my taste (don’t I always 😉 ) and added onions and capsicum for color and taste. 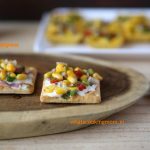 You can easily make these for a large batch and prepare different toppings in advance to serve as an appetizer or you can turn it into a light lunch as we did. 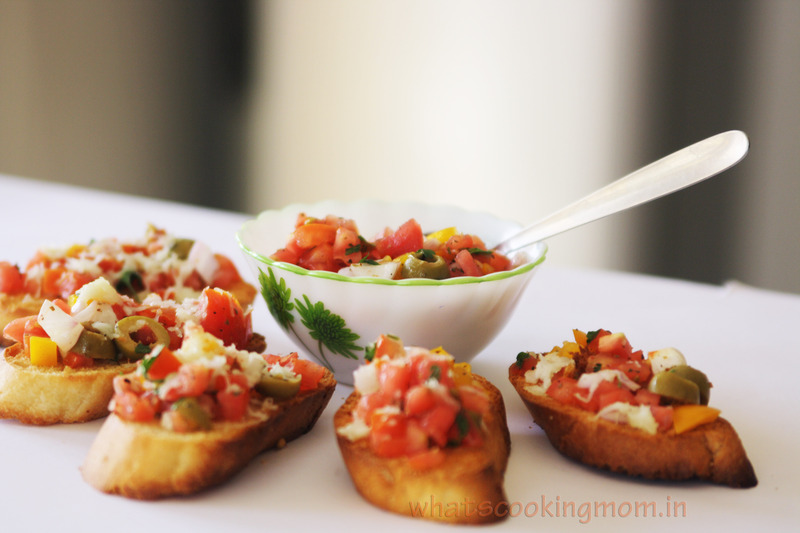 It’s a very simple recipe (this type are my favorite-minimum effort, great results). 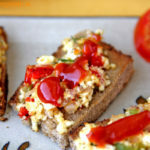 Look for really red and perfectly ripe tomatoes and chop them as nicely as you can as it is the main ingredient in Bruschetta and really dominates the taste. Hot bread topped with tomato mixture and cheese. Hmm…. yummy. Need I say more. Preheat the oven at 180 C for 10 minutes. 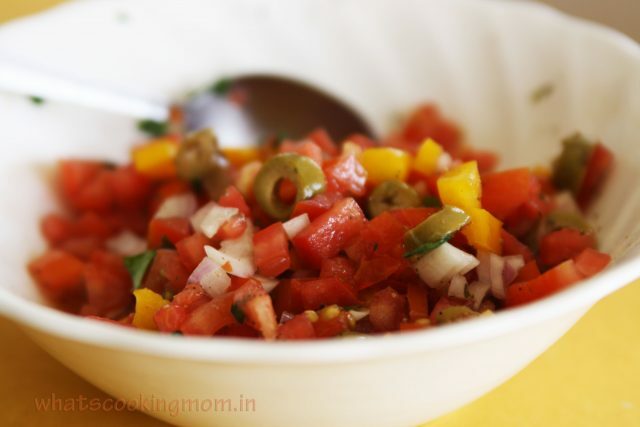 In a large bowl combine tomato, basil, onion, garlic, olives, yellow capsicum. Season this with oregano, salt, and black pepper. Allow this mixture to sit for at least 30 minutes for all the flavors to blend well. 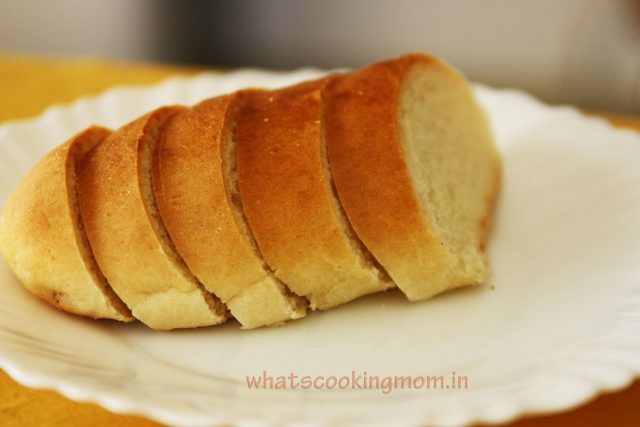 Cut the bread diagonally into slices. 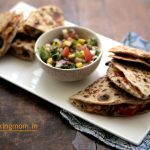 Drizzle with olive oil on both sides. 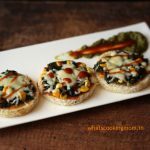 On a wire rack or baking sheet arrange the slices in a single layer and let them grill for 5 minutes until slightly brown and crisp. 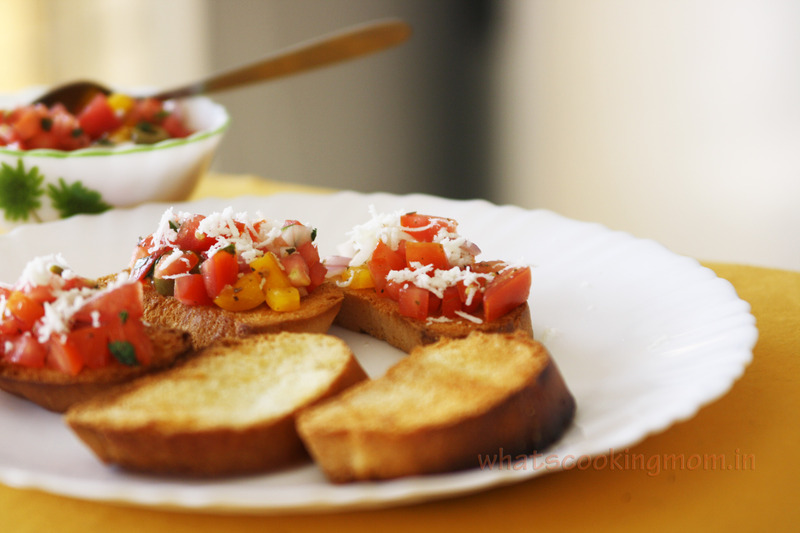 You can also toast your slices but grilling is a better option. 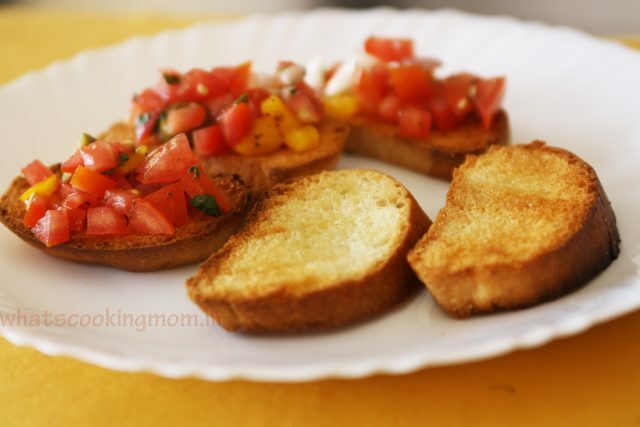 Spread the tomato mixture evenly over baguette slices. Top the slices with Mozzarella cheese and put back in the oven for 5 minutes to melt the cheese. Sprinkle a few drops of olive oil before serving. Serve hot. 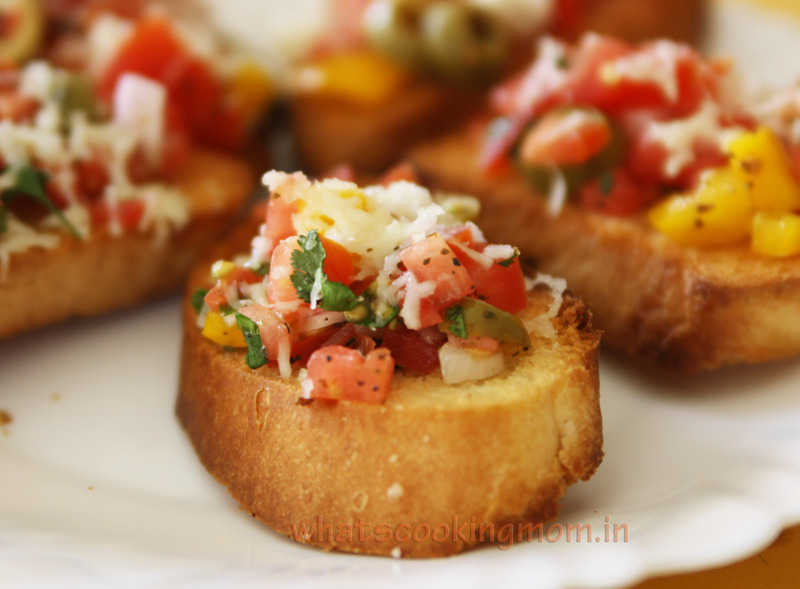 you can add minced garlic in tomato mixture or you can rub it on hot toasted slices. 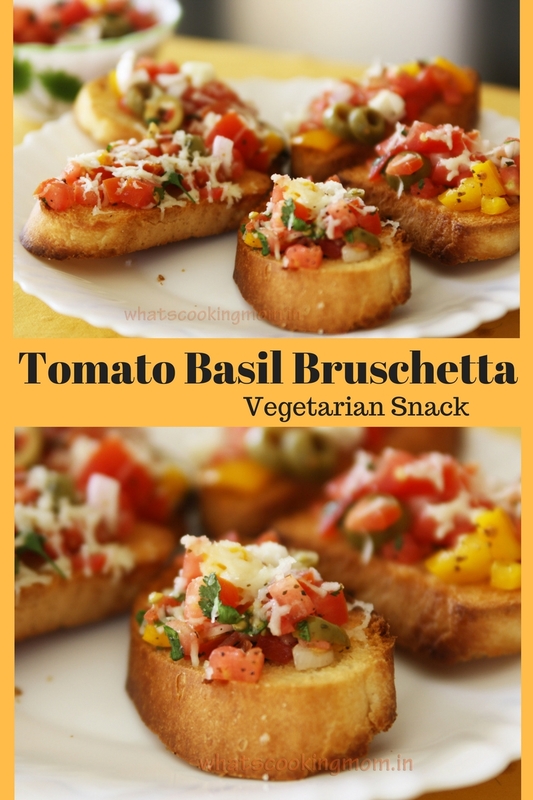 My daughter just loves bruschetta. Thought of making it for her. Only one question. 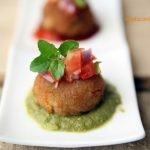 I can see olives in the pics but it’s not mentioned in the recipe. Which type of olives did you use?